Many of us have probably rolled our ankle before and know the symptoms associated with ankle sprains. If you’re one of the lucky few who are here because this is your first time experiencing a sprained ankle, read our blog post Symptoms of a Sprained Ankle; it includes causes, symptoms and treatment options. When you sprain your ankle, it typically requires medical attention due to the pain, swelling, bruising, joint stiffness and difficulty walking. So, how do you prevent a doctor’s visit in the first place? Let me share with you my top tips from a Podiatrists on how to prevent ankle sprains. Many of us are guilty of jumping into an activity without stretching first. Stretching your muscles allows them to warm up and increases flexibility. Try special exercises that strengthen the muscles around your ankle, such as gently rotating your ankle clockwise and then counter clockwise. Another simple exercise is done by gently flexing your foot back, towards your knee, holding for 3-5 seconds then release. Next, flex your foot down, pointing it towards the ground, hold 3-5 seconds then release. These exercises are simple and only take a few minutes. If you are concerned about your ankle health, you can contact your doctor, Physical Therapist, or personal trainer for customized exercises. Exercising your ankle muscles daily can significantly decrease the chances of spraining the ankle during activity. If the muscles around your ankle are weak, you are much more likely to suffer from ankle sprains. It is also important to remember that stretching the ankle after activity is just as vital as stretching before activity. If you have experienced ankle problems before or know your ankles are weak, consider ankle taping. Taping the ankle can provide the extra support the muscles need for a short period of time. The benefits of taping vary from athlete to athlete and may not be for everyone. You will need someone trained in taping to help you stabilize your ankle during activity, such as a Physical Therapist or athletic trainer. If you do not have assistance for taping before activity, consider a low ankle brace that can easily be applied and removed. Contact my office if you think you may need an ankle brace. Never use a brace without proper fitting or recommendation as wearing the wrong brace could lead to additional ankle and/or foot problems. Believe it or not, your shoes could be the difference between ankle safety or ankle sprains. The obvious ankle rollers are high heels or floppy shoes, but did you know your sneakers could be causing ankle weakness as well? Understanding how to properly support your arch and lace your running shoes can help reduce the amount of stress placed on your ankle. If your ankles often ache after running, head into your local running store before your next activity. Stores like Scheels, Nike, or Salt Lake Running Company have team members who can show you how to properly lace your shoes for your foot type. In some instances, they might even recommend a high-top shoe for better ankle support when running or jumping. Balance exercises strengthen the muscles that help keep you in an upright position, such as the core and legs. When you improve your body’s ability to balance you automatically decrease the likelihood of rolling your ankle due to instability. Depending on your skill level and age, start out small by balancing on one leg for 10-60 seconds at a time. As your strength increases, you can try squats, lunges or wall sits. Increasing your balance will help you feel more confident in your movements and activities. Dr. Dickerson was AWESOME. My daughter fractured her distal fibula (ankle) in 3 places. It was a complicated fixation. He had her placed immediately NPO and we returned for surgery that same evening. She had a plate and 8 screws placed. She has healed wonderfully since her initial surgery and just went in for hardware removal of 1 screw placed for stabilization today. She had absolutely minimal pain post-operative and did very well on a few days of Tylenol alternating with Ibuprofen. He never made us feel rushed at any of our appointments and answered all our questions. He was an expert and quite knowledgeable! 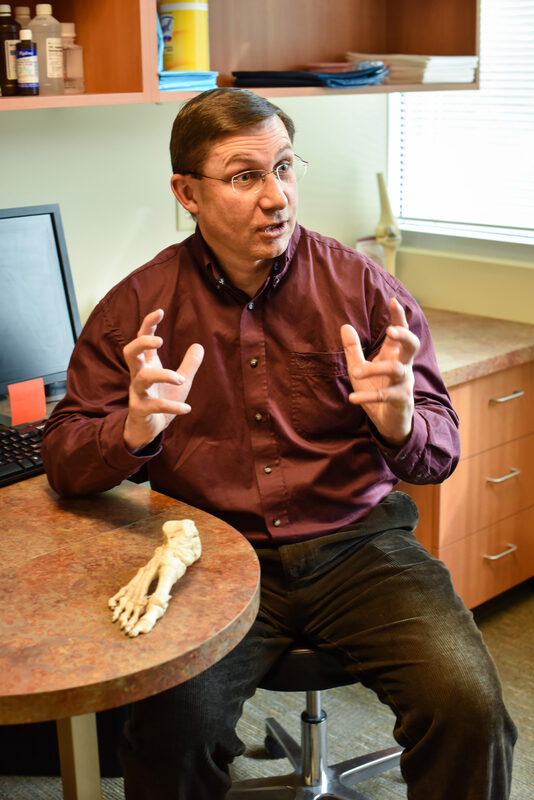 I work at a very well known pediatric orthopedic facility as a hospitalist and had consulted with the orthopedic surgeons I worked with about my daughter's fracture - Dr. Dickerson's medical expertise and recommendations correlated with theirs. He was awesome. I would highly recommend him.